I made these pillows today for my aunt for her birthday. They were pretty simple construction but have quite an impact with looks. 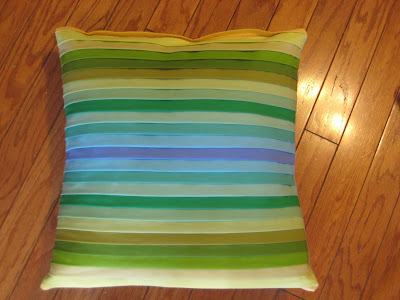 This was the first set of pillows that I have ever made. They are finished in the back with an envelope enclosure to keep the pillowforms inside. I will have to make more of these for the new house. I call this one Blades of Grass. And this one is Sunset. This pillow is based on a tutorial from here; that I found through Pinterest. OMG! You made those today??? You are incredible Brittney! I can't wait to see them in person.